Chose a cat or a dog? Aries, in January, definitely bet on the cat! The 2019 January horoscope recommends to Aries to develop all the "cat’s" qualities you have. These are, for example, explosive beauty, individuality and independence (unlike "dog’s" obedience) and business talent. Men and women born in Aries should therefore take advantage of the superb constellation that is shaping up in the area of society and relations. It is also important not to forget about education. Set up a January goal to read a new specialized book to support your career. Taurus, whether you are the CEO of a bank, a salesman delivering oriental carpets, or a conductor, the January horoscope introduces many reasons for greater management motivation. Even the squeaking door is better to lubricate than to keep dry. And Taurus should make first steps in 2019 equipped with proper managerial skills. Visit a workshop, let successful friends to advise you, and finally don’t be afraid to experiment. Horoscope says, instead of the magic, look for a stable system that will suit you. January is a month when you could appreciate a true softness of a pillow. Gemini, the "golden" 31 days of relaxation are coming close. You may enjoy them; simply get comfortable in the chair and rule the kingdom of your life. Your mother-in-law, the boss, or the silly children, they all can try to destroy the harmony that will bloom in your heart. However, the horoscope advises, forget about them. Nothing is worth more than the sweet and blissful feeling of peace that you have the chance to enjoy. People born under Cancer should prepare for hard negotiations. The January 2019 horoscope shows that this month can take the shape of a desperate snail, a ticking bomb or a steep slope. But all these dangers are easy to avoid by Cancer, just focus on your positive talents. The horoscope recommends: get over your laziness, do not provoke a quarrel, and do not succumb to passions that can cause quick addiction. The January horoscope tells Leo to focus more on health. There comes a month in which you can easily be injured or succumb to viral infections. So what to do? First of all do not panic, but simply avoid the unnecessary risk. Think of an adequate supply of vitamins, and especially if there is someone who can pamper you, let him / her know that now is the right time! January 2019 is the ideal time for marriage! Virgo, if you do not intend to marry, you can at least look for the right prince or princess that will turn your life into a really juicy grapefruit. Why? Because bitterness and difficulty belong to any long term relationships, at least to the same extent as fresh energy and vitality does. It makes no sense to claim that marriage is a perfectly sweet cake. According to the horoscope, in January you should enjoy all what you already have or look for new opportunities if there is nothing to enjoy. 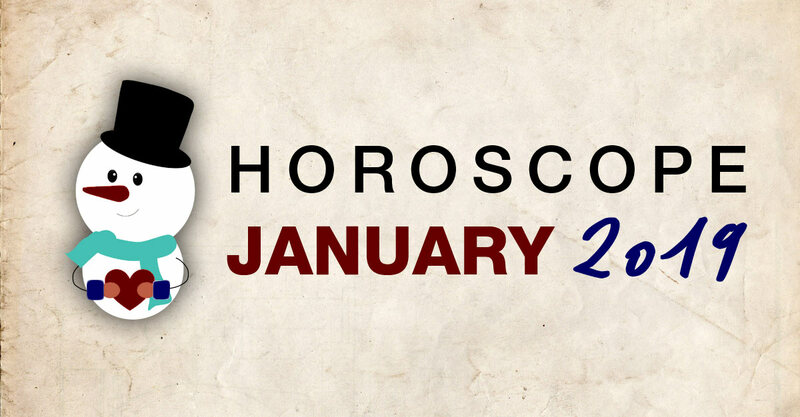 Pure and fragrant bedding, early healthy sleeping, seductive perfume, adequate weight, ball sports, or social encounters with inspirational people, music – these are all the key areas horoscope recommends to explore, test and develop during January. To be satisfied Libra is should start the year 2019 actively. In January, Scorpio will be a true monarch, who will be able to find right solutions in decision making and who will be good in estimating the tastes of others (empathy). January is the ideal time for people born in Scorpio for holiday planning, moving to another location, expanding a business or doing business abroad (including new acquisitions), or for any other life expansion in general. The horoscope also anticipates that January will be a time when Scorpio begins to think more about the family and native homeland. Sagittarius, January horoscope tells us that the first month of 2019 will be typical with the intense presence of the "air" element. In love and in everyday life, Sagittarius will do the best when he or she takes some rest and focuses on regeneration. The fresh new wind (air) will become the basis of better tomorrows. Whether it's your wardrobe, thought or opinion inventory, or the content of your fridge, it's time to get rid of the old and make room for the new one – but slowly, peacefully and measuredly. It is very important to be able to support others. Not only materially but also with kind words that do not cost anything. Capricorn should focus on enhancing the ability to support others when their fate is not favourable. It seems that there may soon come a time when you too will look for a helping hand. You can swear, you can run, you can destroy, but you can solve the mess only when you face it. And the helping hand or kind words will be convenient at that moment. The January horoscope brings a proof that Aquarius is primarily human, not a robot. Your feelings will get the upper hand. Love, hatred, compassion, and many other feelings you've previously managed to count on your fingers will grow more than a thick yellow pages phonebook. Prepare that the senses of Aquarius will be more intense and reliable, which will help uncover those who want to bring you fragrant roses, and those who want to poison your food (at least imagining that). To see a worm is often quite unpleasant, especially in an apple you eat. Pisces, but don’t forget that such a worm may well serve as a great bait for fishing. The January horoscope suggests that Pisces should think about turning things you do not like into something useful and convenient. An unpleasant phone call can serve as an anti-stress training session before meeting your mother-in-law, the day without meals can make your will stronger, and finally a duck’s bite will improve your natural reflexes and accelerate reactions when meeting other feathered friends next time.